Hosted by John Hockenberry and guided by an outstanding panel of advisors, the documentaries and features explore the science of genetics and its ethical, social and legal implications. Produced by SoundVision Productions and distributed by National Public Radio, the series has met with wide acclaim across the country. 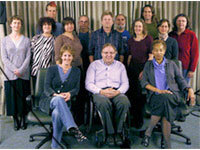 Major funding for the 2007 series is provided by the National Science Foundation, U.S. Department of Energy, National Institutes of Health and Alfred P. Sloan Foundation. The DNA Files has been recognized with some of the most prestigious awards in journalism.